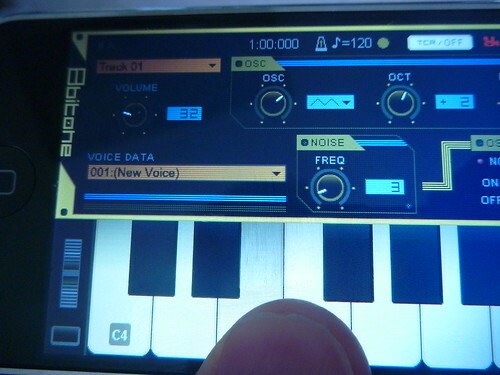 One of the many unique synths that have been cropping up on Apple’s mobile devices, (CC) Beanbag Amerika. Rounding up my catch-up-on-iPod/iPhone-stories, here’s one from the developer perspective – one that could face music creation developers on the entire platform. The Apple iTunes App Store now faces the risk of becoming a victim of its own success. Music applications could be a big part of that, without some adjustments on Apple’s part. The problem is this: incoming music “fan” apps could flood out the music production apps that had enriched the mobile software platform since its debut. I think the need could be really urgent. Consider that part of the appeal of Apple’s mobile platform – yes, even in stark contrast to the Google Android on which I’ve been developing myself – is its spectacular real-time audio tools. Combine that with a disproportionately large number of Mac-using musicians, lots of ingenious apps build on Apple’s Core Audio platform, and we’ve seen a mobile platform with an extraordinary number of tools for music creation. The problem now is that that unique set of powerful apps could get overwhelmed by essentially unrelated “music” apps. A developer who has asked to remain anonymous is already campaigning for a change. He does a good job of explaining the issue, and what might need to happen to fix it. If you’re a developer, you can add your support and feedback to the idea. Recently the Music section of the App store has gotten very busy with a new type of app, lets call them Artist Apps or Fan Apps. Some of these Apps are great resources for fans and artists reaching out to their fans and potential fans, and some don’t live up to their potential. However, they are joining a category that previously moved a lot slower, as the apps that had been populating this category were apps with a lot of development put into them and therefore sold at a higher tier usually- but were released at a slower pace. A look at the top 100 paid music apps illustrates this nicely. Customers perusing the music section to catch that next great sound generating tool (for example), could check in on the new releases section perhaps once a week or even once a month and have the opportunity to check out all the great new apps that had been released, without worrying that one was missed. Now however, these newer Artist apps have flooded this category, and great apps are getting lost in the shuffle. On one day last week, there were 21 pages of Artist or Fan apps, with a few “other” apps strewn in the mix here and there, very hard to pick out of the jumble. I understand that this may be happening in other categories for other reasons, but I only concentrate on the Music section since I am a music producer and music App writer. I propose that we all get together to come up with some suggested sub-category names for the music category. I will start the list off and hopefully some of you will chime in and give suggestions for other categories or add more definition to a sub-category that is alredy here. Once enough input is received, I will compile it into one bug report for Apple. i will then post the bug# for everyone to include with any correspondance with Apple on this issue. New sub-categories for the Music section of the App store. iLike apps, Deadmou5 app, PVD App, Underworld App, NIN, etc. Please visit the Apple iPhone developer forums and voice your opinion/support! Definitely voice your thoughts to Apple, but I’d love to hear what you think here on CDM, too (especially since I know some folks at Apple do read this site).